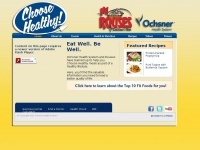 Ochsner Health System and Rouses have teamed up to help Louisiana live healthy by choosing healthy. From grocery lists that allow you to shop healthier at Rouses to articles from Ochsner offering advice on healthful living, you'll find the valuable information you need to lead a better quality of life. The web server used by Choose-healthy.org is located in USA and run by Leaseweb USA. There are many websites run by this web server. The operator uses this server for many hosting clients. In total there are at least 104 websites on this server. The language of these websites is mostly english. Only a few websites on this web server are x-rated. A Nginx server hosts the websites of Choose-healthy.org. The website does not specify details about the inclusion of its content in search engines. For this reason the content will be included by search engines.